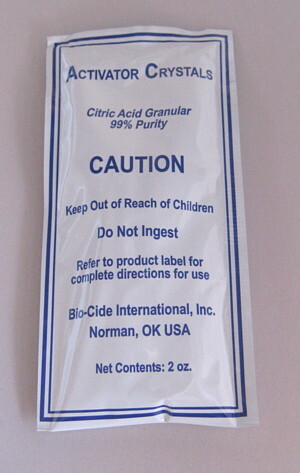 Citric Acid Crystals - 2 ounce packet of Citric Acid Crystals for activating Purogene water treatment for system sanitation. Each packet will activate 1 pint of Purogene (16 ounces) to produce a 50 PPM sanitation solution. 2 packets are required to activate 1 quart of Purogene. Price does not include shipping. 50 state shipping for 1 packet is $3.75, 2 or 3 packets is $4. Shipping for any quantity more than 3 will be based on the total weight. When ordered with Purogene, there will be no additional shipping cost to add Citric Acid Crystals.